I saw this quote today and it really spoke to me. When I was a teenager, I would look at the articles in Seventeen magazine and do the exercises and makeup that were written about there and wonder why I didn’t look like the models. That’s because I was trying to imitate women who I could not possibly resemble. I am not Whitney Houston and I never can be. Only Whitney Houston can be Whitney Houston. The same thing happens today. Here is an example from OK! magazine called, What I Ate Today, featuring Jayma Mays. If I ate what she ate, will I look like her? Never. If I ate what the expert says I should eat, would I look like her? Nope. No one can be Jayma Mays but Jayma Mays. Once I realized this, all those women’s magazines lost a lot of their appeal to me. I used to read them avidly, hoping for the magic answer. Here’s the magic answer: You can never be that, and that’s okay because you can be YOU and that’s even better. Once I realized that, so much of the absurdity in my life evaporated and was replaced by sanity and productive activity. 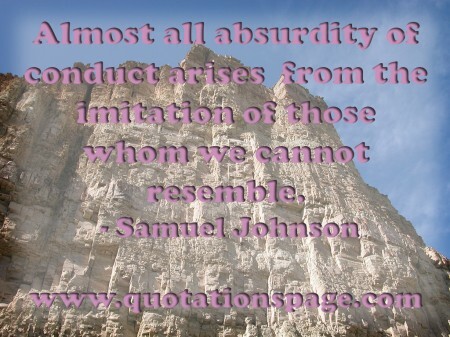 Don’t waste your time trying to imitate those you cannot resemble, and you will can have that sanity as well.